We have had some pretty cold days and nights here that remind me much more of winter than fall! Instead of raking up a leaf pile with just a cozy sweater, we had to get full on winter gear! The kids still loved it anways!! We raked up some big piles and they jumped in them, slid down into them, and just threw them at each other. Jackson was a big helper and pretty much built the pile all by himself. Brrr! That wind is chilly!!! Getting ready to throw a monster pile of leaves at Beckett who quickly figured out what was happening and took off! Jackson was student of the week! Each child at his school is student of the week and they take home this fish. They are supposed to take a photo of them with the fish, fill out a sheet that tells facts about him like where he was born, birthdate, favorite color etc, and some pictures of his family to present to class. Jackson was so excited and the first thing he said was he wanted to take a picture hanging from the basketball hoop, so that is what we did. Each child in the class then draws a picture of Jackson and writes why he is special. It is compiled in a book and he gets to keep it. I loved reading what they other kids said about him. Some favorites were that Jackson is special because he has pretty hair, he is always nice to me, he has a house, and he likes to play with me. Kindergartners are so stinkin cute!! I will certainly treasure this sweet book forever!! This boy can't wait until it is his turn to play baseball! He has gotten pretty good at hitting it off the tee. Now, where he is supposed to run after he hits it, is another story! We have been battling some colds in our house the last few weeks, so this is what our bed has looked like. I am not sure where Greg and I are supposed to fit! Since Greg and I were not getting the best sleep with 2 additions, we decided to see how the boys could do sleeping together. Beckett certainly loves it! He piles a bunch of toys in his bed and you can hear him making playing noises for about 30 minutes. Luckily, Jackson falls asleep as soon as his head hits the pillow and sleeps like a rock because Beckett's noises do not seem to phase him at all! Since I have been spending my days off going to the eye doctor, I decided to take advantage of the babysitter and surprise Jackson for lunch! He was so excited. It was so cute how all the kids came up to me and yellod, "Hi Jackson's mom!" I was so impressed with how well behaved they were! Jackson had a playdate on Saturday and spent a special day behind the scenes at the zoo feeding elephants, so Beckett had mommy and daddy all to himself! We did some shopping and topped it off with a Ghirardelli sundae. It doesn't get much better than that! Church bow ties! Jackson really didn't like wearing the flower bow tie I bought him, so this time I bought them Marlin ones. Jackson was much happier with this one! Happy 39th birthday to the best husband and daddy anyone could every ask for! We had a birthday celebration with friends the weekend before his birthday and then had the family over for pizza and cake. We love you more than you will ever know and can't wait until next year when we get to celebrate the big 40!!! Finishing off the day with a slushie! Jackson had the best time and his buddy Jack was so sweet to buy him his favorite animal...the lion. For some reason we are on a lion kick right now. He even asked me if he could have a lion cake for his birthday! I also had to share this pic. 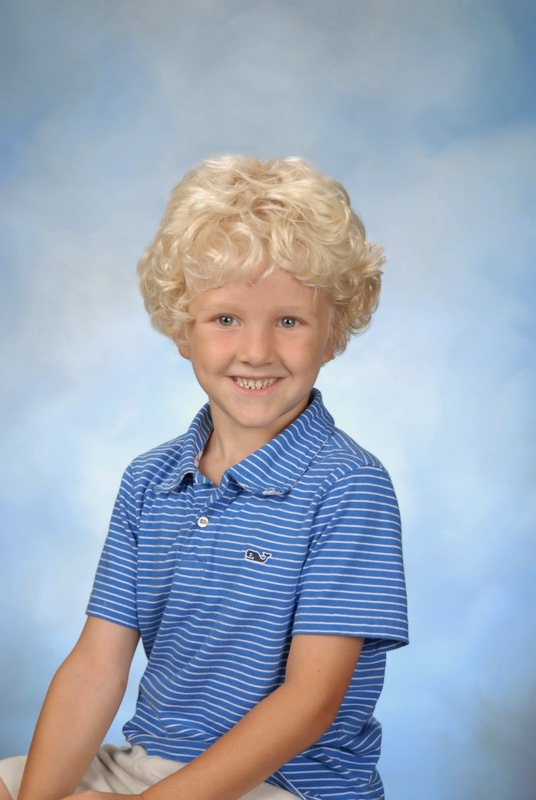 This is Jackson's sweet Kindergarten picture at Walker. I am not sure how they got him to smile but I was so impressed!! This is a really long post, but I have been a little under the weather the last few weeks. Greg and I decided to go to a trampoline park called Sky Zone with some friends to play dodgeball....yes, dodgeball. Within the first 5 minutes, I was hit in the eye and developed a hyphema, which is bleeding in the anterior chamber. Because of all the blood, I can't see out my right eye and am on 3 different eye drops. I have been going to the eye doctor every 2 days to get my pressures checked and today was the first day that they have strarted going down! I am on limited activity because of risk for rebleed, which is totally annoying, but at least, I should make a full recovery in a couple months! Now for a super long post! First of all, we have to say Happy Birthday to a very special 2 year old, Ben!! Beckett hitting the baseball. He crushed it! This boy can't wait until it is his turn to play tball! After each game they were able to pick out some candy. Beckett is very particular. Color toss. If you win a game, which Jackson won this one, you get to pick out a prize. Jackson chose a gorgeous spider ring. Last year Jackson was too scared to go throuh the bat cave, but this year he was ready! Here he is posing at his favorite teacher's grave, Mr. Llopart. While Noni and Granddaddy were here they met with Angie and Papa to make some more decisions about their house. We can't wait for them to have a house in our backyard!!! Jackson had homecoming at school and each day they had a different theme. This was dress as a character day. Jackson finished his baseball season and we couldn't be prouder! He did great! They made it to the championship game of the tournament and played their little hearts out. It was a nail biter and they lost 6 to 7. We had to play the same team twice and the first game we lost partly due to several errors at third base. We go the call the night before they were moving Jackson from 2nd to 3rd. I was so proud but also very nervous! He did awesome and only missed 1 ball! Great job Jackson!! Batter up! He got an RBI! Such a great team with great coaches! Sad it is over but can't wait until spring ball! Jackson is on to basketball!! Super proud of our baseball star! Trunk or treat at the church! Beckett couldn't get enough candy. Beckett, do you like chocolate? Jackson concentrating very hard on his masterpiece. He drew a triceratops and a jack o lantern face. I made an error while cutting out Jackson's pumpkin face, so daddy came up with the brilliant idea to attach it with toothpicks and make it look 3D. Perfect! Emma decided to join in on the fun! She mostly just ate the pumpkin guts. Jackson's school celebrates with a Halloween parade. The preschool and Kindergartners get dressed up and parade around the gym and lower school. Beckett was super excited to go to the gym. When he got there he wanted to watch the "game". When he was that it was just the kids in costumes parading around, he said "I didn't like that game. It was boring. " Prior to trick or treating we went over to friend's house for a chili dinner. It is so funny to see Jackson play now. Now he is running around playing football with the older kids instead of playing with toys etc. He is gowing up too fast! We were supposed to go on a hayride, but it started pouring down rain so we quickly hit a couple of houses before calling it a night. We always have to go to the "scary" house! Last year Jackson was terrified so I was surprised he wanted to go back. This time he was ready! Afterwards the kids started trading all their candy. This was always my favorite part of Halloween!